Good design is good design. This applies to graphic design, newspapers, and even interior design, and definitely to infographics. Adequate balance gives your infographic visual stability, preventing one element from dominating the visual and inappropriately pulling readers’ focus. It keeps the design from being top- or bottom-heavy or skewing to one side or the other. A terrific rule of thumb for creating a balanced infographic is to divide your page into thirds, using a grid, as shown in this figure. The thirds can go from left to right, or from top to bottom. Either way, your dominant element — the part of the graphic that illustrates your main idea — should occupy about two-thirds of your design. There’s more than one way to create a visually appealing infographic. Refer again to the three examples in the previous figure. The first features only three distinct art elements: one dominant chart at the top left, a smaller art element at the top right, and a fairly large element anchoring the bottom. The second has six parts, so it is a bit more complex, but still nicely balanced and quite clear. Again, it has one visually dominant element. To unite the rest of the design, use spacing, subheads (generally a word or two that leads into a new section) or decks (a sentence or two that adds information), and color to guide the viewer through the narrative. The third layout allows the dominant element to take up the entire top of the graphic. This might be a good choice if the artwork is very appealing, or if the story is really compelling. Supporting information takes a back seat, at the bottom of the infographic. Any of these three layouts would work really well. The nature of the data and the character of the illustrations will determine which layout works best for your infographic. “White space” is a really important element of design that can help you achieve balance in your infographics. First off, white space isn’t always white — it’s just the name for the open space between art and text elements. White space allows the eye to take a break between one part of your infographic and the next. It ensures that your graphic is clear and legible. You should build some white space into your design. Don’t just slam together your artistic elements and let the gaps serve as your white space. 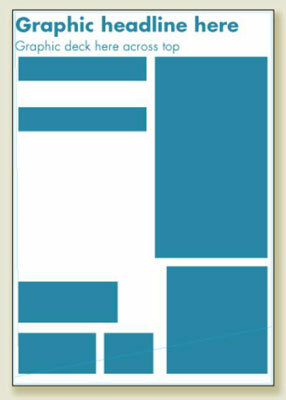 The following figure shows how random white space can actually damage the balance of an infographic. This graphic would be improved by bringing the smaller art elements into proportion with each other, and creating more equal amounts of white space between them all. Consider the number and type of illustrations and charts you’re showing, and think about their content as well. You probably don’t want all your supporting elements to be line charts because that would be boring. You don’t want to create a hodgepodge of data visualization, either, because that can dilute your message. Experiment with forms that will support your dominant element without distracting from it.